For those who dream of seeing the world from up above, the CN Tower in Toronto, Ontario, can take your imagination to new heights. The colossal engineering spectacle has been classified as one of the Seven Wonders of the Modern World and has broken numerous world records. Standing at a height of 1,815 feet, the CN Tower’s strong glass walls and floors provide guests with an adrenaline-pumping view of the Earth below, which seems to disappear as the elevators ascend. The CN Tower is an iconic landmark that should be at the top of your list of things to do in Toronto . The CN Tower draws in over 2 million visitors every year, which means that there are a few things you’ll need to prepare for in order to skip the crowds and make the most of your visit. Toronto CityPASS gives you a jumpstart on your quest to defeat the long lines; simply present your booklet to the ticket holders entrance to avoid the main ticket line and make your way to the top. 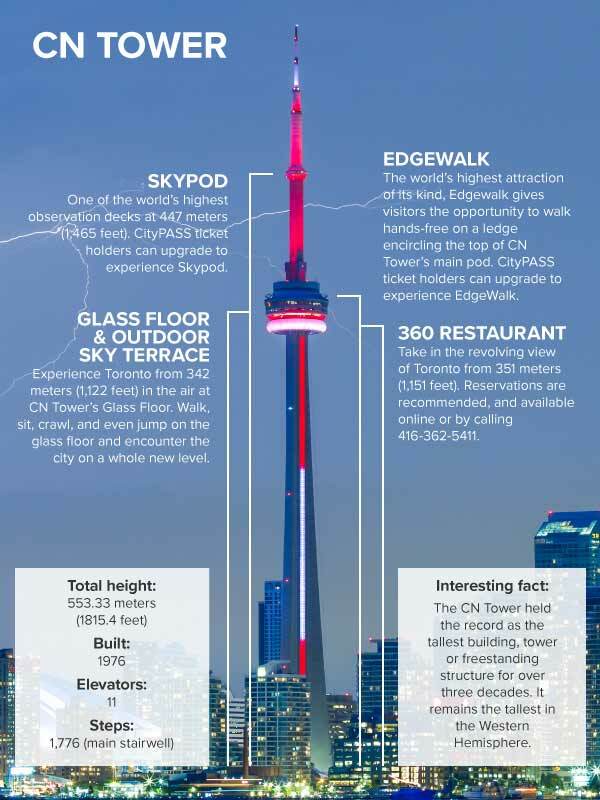 CityPASS gives you access to the CN Tower’s renowned Glass Floor and outdoor SkyTerrace, plus the thrilling, fast ride up to the LookOut level, which is host to a restaurant and dance floor. 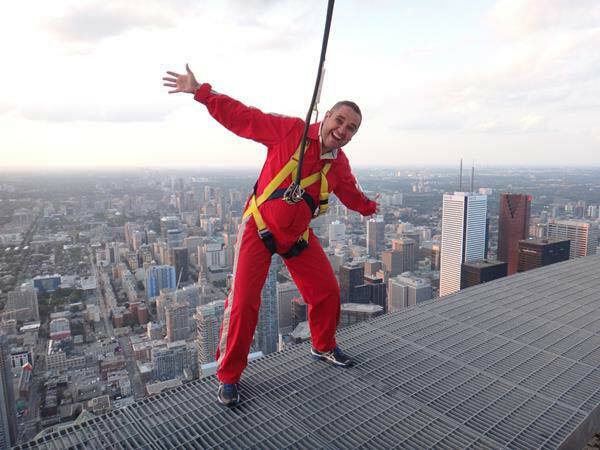 For additional adventures, you can purchase a $12 ticket to reach even greater heights in the CN Tower SkyPod, one of the highest observation platforms in the world. The elevator starts at the LookOut level and takes you an additional 33 stories up where an incomparable view of Toronto will make even the city’s taller skyscrapers seem remarkably miniature. The glass floor is intimidating, but it doesn’t stop the flocks of visitors from stepping, jumping, crawling, or taking selfies on it day in and day out. If you’re looking to brave the glass floor yourself but want a little room to spread out, try getting to the CN Tower before 11am. Most crowds start filling in at around 12pm, and weekends are always the busiest. If you want to catch the night sky view, crowds thin out after 7pm. A weekday morning CN Tower visit will keep your personal bubble intact, and you’ll still get the breathtaking, albeit nerve-wracking, view you came for. If you do visit the CN Tower’s Glass Floor when there’s a crowd and you need to catch a breath of fresh air, head to the Outdoor Sky Terrace and feel the wind in your hair. If looking down 1,000 feet to the ground makes your stomach feel like it's floating, weigh it down with some delicious Canadian cuisine from the CN Tower’s revolving 360 Restaurant. Plan ahead and make reservations because there are plenty of others trying to fit an after-tower lunch or dinner into their tour. The restaurant revolves slowly, allowing guests to take in their meal along with the entire 360-degree view in just over an hour (72 minutes, to be exact!). Couple your delectable dish with a glass of wine from the award-winning wine cellar—the world’s highest. Book a reservation in the early evening to see the city transform before your eyes as a beautiful pink sunset graces the horizon and brings forth the night sky, illuminated by the twinkling city lights of Toronto. Food may be pricey but it’s excellent, and many have praised its worth based on the phenomenal view alone. Plus, you won’t have to shuffle through a crowd for a quick glance; you’ll have the entirety of your delicious meal to take in the magnificent view. If you’re looking for a more casual refuel, the Horizons Restaurant and Le Cafe are great alternatives. Though you won’t get the amazing 360-degree view of the city, Horizons offers tasty Toronto food on the LookOut Level, which means you’ll still be getting a pretty great view—minus the rotation. Reservations are not required for Horizons, making it a reasonable option for visitors who decide to add an impromptu bistro meal to their tower visit. Le Cafe is at the base of the tower and is great for a quick, casual bite on your way out or in, before the jet-fast journey upward. There are plenty of other quality local restaurants you can explore near the Tower, such as Boston Pizza, Sightlines Restaurant, and Baton Rouge, each only 0.1 miles away from the CN Tower. For the bravest of guests, the Edgewalk is a hair-raising sensation that’ll make the Glass Floor look like a cakewalk. The Edgewalk tethers you to a harness connected to the overhead safety rail atop the 360 Restaurant’s roof. You can walk hands-free along the circumference of the tower. Lean back and don’t relax; guides will encourage you to test your limits and let fear be forgotten as you take on the crisp Toronto air and the stunning view of Lake Ontario. Tickets are $225, but you’ll walk away not only with a great memory and bragging rights, but also a keepsake video and set of photos to remember your frightened face by. If the rise and descent of the CN Tower’s fast elevators isn’t enough excitement, check out the motion simulation ride that evolves over time to meet the powers of current technology and create an eternally immersive experience. Watch the 20-minute film about the history and creation of the CN Tower called "The Height of Excellence,"" which will give you some insight as to the labor and impressive engineering that went into making the tower. The CN Tower adds a bit of color to Toronto’s night sky with its LED Night Lighting. The colors and patterns change over the year to reflect important events around the city and the nation. If you’ve got a favorite color you’d love to see streaking the sky 1,800 feet high, check out the lighting schedule to see what days your colors will shine bright. There’s parking all around the CN Tower, and you can save a few bucks by parking a few blocks away. The nearest major parking garage is at The Metro Toronto Convention Centre, with a daytime max of $21. There are other lots that charge a $5 - $20 flat rate fee, depending on the day, proximity to the tower, and whether or not there are other events going on. A flat rate lot is a good investment if you plant to explore other downtown attractions, such as Ripley’s Aquarium of Canada or the rest of the Entertainment District. You can also park your car at a commuter lot and take the subway downtown for an even lower flat rate. Getting to the tower is as simple as looking up! Seriously. If you’ve come to Toronto by plane, cab / Uber / Lyft drivers of Toronto are going to know where the CN Tower is—it is, after all, one of the city’s most renowned attractions, and it’s truly difficult to miss. Enter via Bremner Boulevard for convenient drop off and parking. The CN Tower is open 364 days a year (closed on Christmas), and hours are from 9am to 10:30pm. Hours are extended on weekends and seasonally. The views are best when skies are clear and crowds are small. With CityPASS, CN Tower tickets are included, and you can visit Toronto and its finest attractions in any order you see fit. Always be sure to check out the weather for the week so you know when to get the best views. Keep your eye out for other events that may create a bigger wave of tourism during your stay, which is especially the case during the summer. 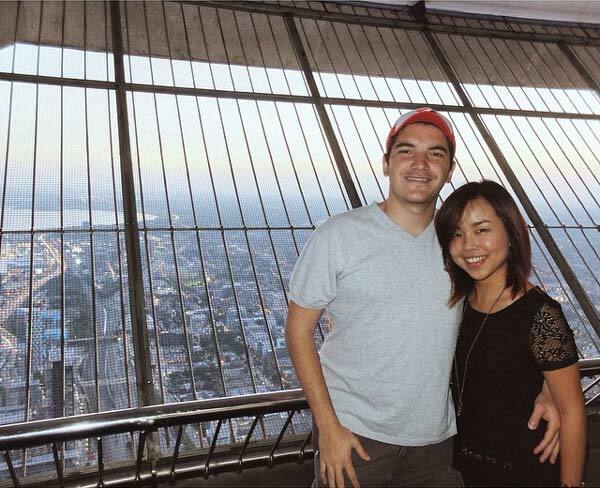 There are plenty of things to do in Toronto, but the CN Tower is a bucket list adventure worth having. Though the crowds can be overwhelming, knowing when to go and what to look for will help you to make the most of your visit to the CN Tower.